Soak Urad Daal for minimum of 6 hrs or overnight if possible. Drain off all of the water and grind daal in a blender using very little water. Remove batter into a bowl and add Salt and Roasted Cumin Powder. Whip the batter with a spoon to make it light and fluffy. To make the vadas, wet you hand and scoop up a small portion of batter in your hand. Using your thumb, make a small hole in the center of the batter. Gently flip the batter into the hot oil. Repeat process for all the batter. Allow the vada to cook until golden brown on one side and then flip to the other side and cook again. Remove the vada onto a paper towel lined plate and let them cool for a few minutes. Take a medium bowl filled with water and add a little salt to it. Drop the cooled vada into the water and allow them to soak for 15-20 minutes. Remove vada and gently press them in your palms to squeeze out the water. Place squeezed vada into a serving platter or dish. Add enough water (or milk if your yogurt is sour) to yogurt to make it pouring consistency. Pour yogurt over the vada to completely coat and submerge them. 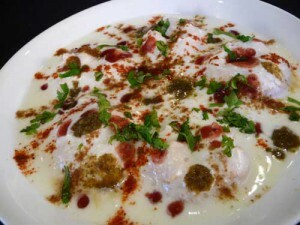 Sprinkle Chaat Masala, Roasted Cumin Powder, Red Chili Powder to taste over the yogurt. Top with Coriander or Mint Chutney and Tamarind Chutney. Previous: Healthy Cereal Chivda – A Perfect Munchie!